hen Gov. Gavin Newsom announced in February that, as currently planned, the state's full high-speed rail project would take too long to build and cost too much, farm bookkeeper Joanna Spence was relieved. For her, that acknowledgement was long overdue. The bullet train has long been a difficult subject at Parichan Farms, a large almond ranch in Madera County that sits directly in the path of the high-speed rail line. Late owner Harold Parichan fought the project’s encroachment on his thousands of acres of almonds and other crops. Several years ago, around 50 acres were cleared to make way for the trains' right of way. There’s now a diagonal path straight through the orchard outside Spence’s office, where she’s worked for over 20 years. In one area of the farm, the contractor for the bullet train project is building a $2.5 million underpass so farm crews will be able to get from one side to the other. Instead, Spence said, much of the cleared land has gone to weeds. “We could have been farming those trees, and making more money for the ranch,” Spence said. Immediately after Newsom made his announcement in February, he tried to clarify his administration's plans for the project: The initial focus will be to get the bullet train running on the 170-mile route from Merced to Bakersfield during the next decade while finishing environmental studies of the full "Phase One" line from San Francisco to Los Angeles. Phase One would still be built at some unspecified point in the future. “Why would I ride it to Merced? Even Modesto. I could be there in 45 minutes,” she said. “And when I get there, what am I gonna have to do? First I’ve had to pay for a train ticket. Now I’m gonna have to rent a car or an Uber. “We’re not even the ones who wanted it. It was the people who commute,” she said. What Newsom did not acknowledge is that when it comes to high-speed rail, some of the most disillusioned and skeptical Californians are Central Valley residents themselves. While some dream of the opportunities a bullet train could bring, others see it as a misuse of funds and believe that it will never be built — or that if it ever is, no one will ride it. When voters approved a $10 billion bond measure in 2008 to fund high-speed rail, they were told it could be running between Los Angeles and the Bay Area in little more than a decade and cost about $34 billion. In its most recent estimate, the California High-Speed Rail Authority said the link between San Francisco and the L.A. area would be finished in 2033. That's if the authority can locate the tens of billions of dollars more needed to pay for the project, now priced at around $77 billion. Right now, about 2,600 construction workers are working on 119 miles of the route between Madera and Wasco, the latter a town just north of Bakersfield, by the end of 2022. 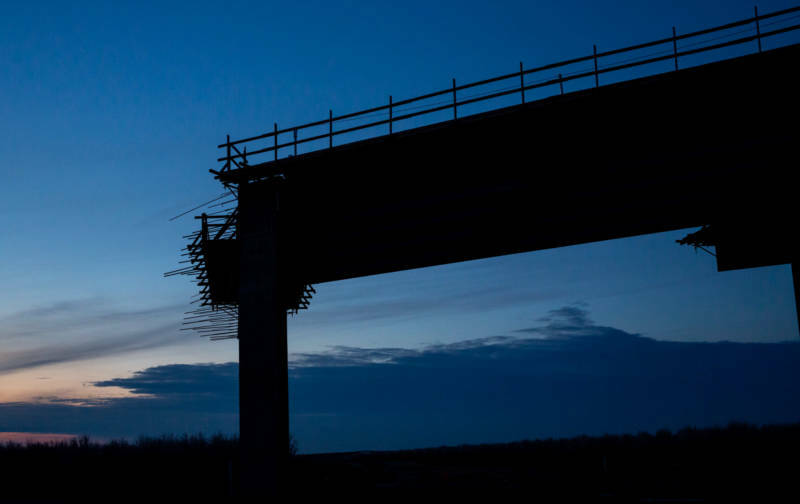 That deadline is part of the rail agency's agreement for $3.5 billion in federal funding — money that the Trump administration is now trying to take back. Annie Parker, a spokeswoman with the bullet train agency, said service from Madera to Bakersfield could start by the end of 2027, with passengers riding from Bakersfield to Merced a year later. “This is more of a commitment to the Central Valley,” Parker told KQED. As for connecting the rail to San Jose and elsewhere, Parker said, "It’s not on hold. We will work to get to those regions." In the Bay Area and Los Angeles, the high-speed rail agency has helped fund infrastructure that could someday be part of a bullet train system. In the Bay Area, those projects include the Transbay Transit Center and Caltrain's electrification project. But actual development of high-speed trains in the state's two biggest metro areas? “We don’t have the funds in hand to build Phase One, to build San Francisco to Los Angeles," Parker said, adding that the agency is "working to establish a full funding package for the delivery of the high-speed rail project." Even though trains might not run for years, residents are already feeling the effects. So far, at least 230 businesses in Fresno have relocated to make way for construction, according to the rail authority. Central Fish Co., a seafood market and Asian grocery in Fresno's Chinatown neighborhood, has been able to stay in its current location, unlike other businesses that once surrounded it. 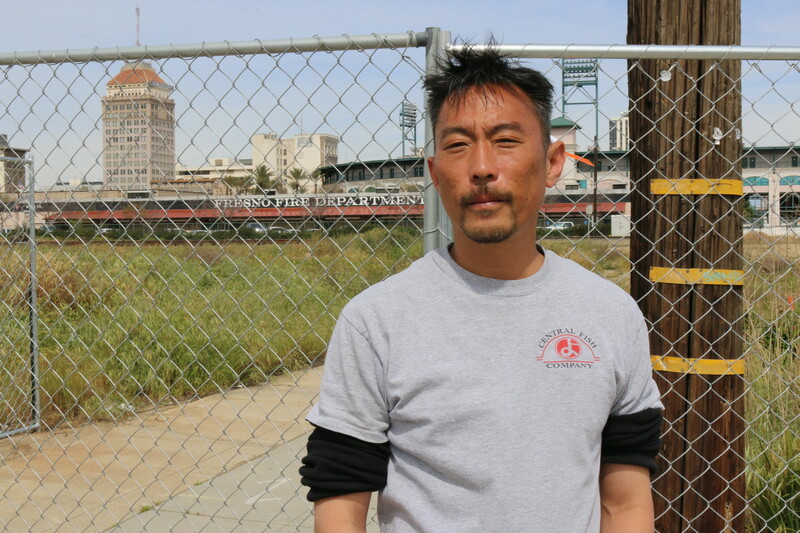 “We’ve been dealing with this for a few years now and we’re just trying to hang in there,” said Morgan Doizaki, general manager of Central Fish Co.
Doizaki supports high-speed rail. He just wants it to get built — sooner rather than later. “Fresno needs something big like this,” Doizaki said. In the meantime, "the biggest challenge is surviving." 'I think there's a lot of people, if they actually ever ride on one they'll have a different opinion. ... We don't want to sit on freeways for three and four hours to get just from one city to another. This is that option to get us out of that rut. But it might just take another generation to do that.' Lee Ann Eager, Fresno County Economic Development Corp.
A fence built recently between high-speed rail's right of way and the existing Union Pacific line has cut off foot traffic between an already isolated Chinatown and downtown Fresno’s popular baseball stadium, Chukchansi Park. Some businesses, Doizaki noted, have done well since relocating, including the Cosmopolitan restaurant that was once in Chinatown but has since moved a few blocks away. Fresno County’s Economic Development Corp. has been assisting businesses along the rail line alignment or otherwise impacted by road closures. When asked about Newsom’s plan to focus on finishing what the authority has started in the Central Valley first, EDC President and CEO Lee Ann Eager said the policy does not signify a huge shift. Eager said she is aware of the criticism coming from Central Valley residents who think no one will ride the train if it does not connect to the Bay Area. “That has really always been an issue with us here is that we had expected the entire Central Valley to understand what those opportunities would mean for us,” Eager said.